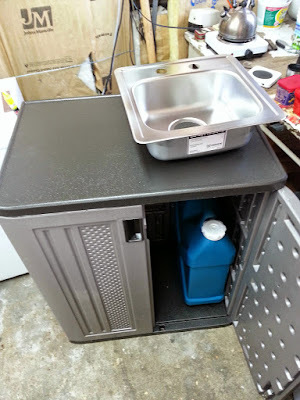 This is my version of the DIY portable sink. I've seen quite a few on the interwebs and thought it would be a great addition to my garage. But since it freezes here it will also include frost protection. Right now I'm thinking there will be several versions due to the cost of this device and that I need something that will work soon. To save initial costs a hot water heater will be added later. Everything else will function as planned. shorten and support feed, waste hoses, add 90* to drain. Working on layout and measurements. 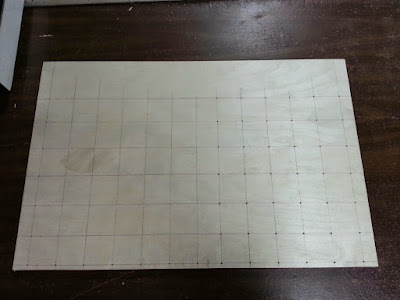 Layout of plywood top. Intersecting lines are where to add screws to mount to plastic. Final fitting and marking where to put ancors for sink mounts to plywood. Sink mount reinforcement when using top pull downs. 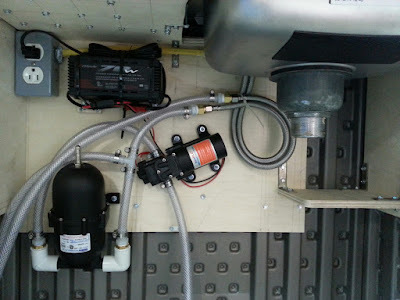 Pump, diaphragm, power supply, bulk soap shelf, empty socket for future addition of a water heater. 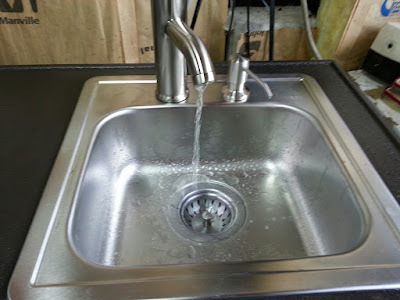 1.2GPM is perfect if not too much for just hand washing. Just picked up a set of garden hose disconnects to use for waste and fresh water tanks to aid in removal. Haven't figured out what fittings are needed yet. Decide to skip to running water as the jug I was planning to use is just toooo heavy for the top of this cabinet. Spent a long time trying to decide what faucet to use, a pullout sprayer a normal cheapy. But what I ended up deciding is to use a single hole faucet and use a soap dispencer in the other hole. There is only a slight problem as this makes the faucet slightly askew and not centered. At the time I bought the parts (because im writing this before assembly) it seems it should work fine. Installed 1/2" hardwood plywood to the interior. Mounted the pieces with predrilled 7/32" (this should have been bigger to allow screw to spin and bite more plastic. but seems to hold very well anyway.) 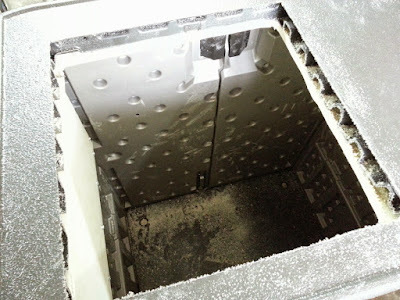 holes and installed with #10 3/4" hex head sheet metal screws. 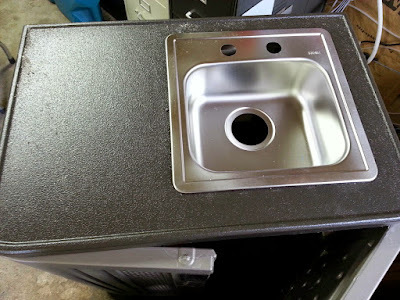 Cut opening for sink basin and prepared for mounting. 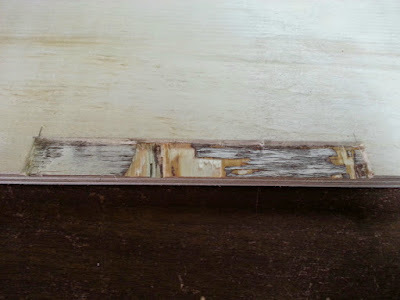 Problem is sink clips aren't long enough for the thick top combined with the plywood reinforcement. So I came up with using longer screws (and slightly larger) #8 sheet metal screws in to the clips instead of the supplied #6 1". 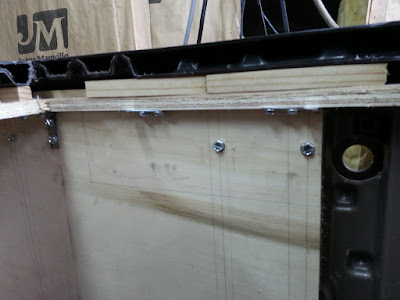 Then to have that anchored down, I'm using flan 90* metal braces that are screwed into the plywood with #8 1/2" hex head sheet metal screws predrilled with a 7/32" bit. 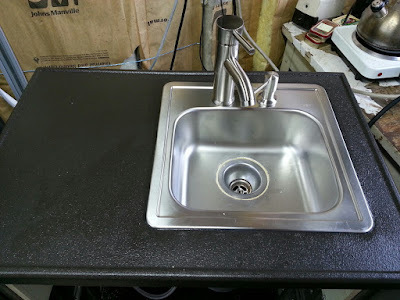 Installed pump, diaphragm, shelf for soap, caulked and mounted sink, routed and plumbed hoses. Final touch up bits are noted but is now functional. designed/build feed straw for water supply. After using about 1 tank in over a month of just handwashing. The grey tank does get a bit of funk going. I am now using grey water deodorizer from camco. Shall see how well this works as now I could rinse out coffee cups and drink cups.